Elementals: Ice Wolves is one of the six books shortlisted for this year’s Readings Children’s Book Prize. Here’s everything you need to know about this breathtaking fantasy adventure. ‘Orphaned during the last great battle between the warring Ice Wolves and Scorch Dragons, 12-year-old twins Anders and Rayna grew up on the streets of Holbard, a lively harbour town in the icy country of Vallen. They are used to looking after themselves and each other, but they are separated when Rayna is recruited by the destructive Scorch Dragons. Anders enlists at the foreboding Ulfar Academy, a school for young wolves that demands loyalty to the pack, as he tries to find a way to rescue Rayna. Book two, Elementals: Scorch Dragons is out this month. Enthusiastic readers who love action-packed fantasy, diverse magical worlds, brave quests, epic battles and stories of sibling loyalty will race through this book. If you know a reader who wants high-stakes fantasy but isn’t ready yet for young adult books, this is the perfect cross-over. For ages 9 and up. 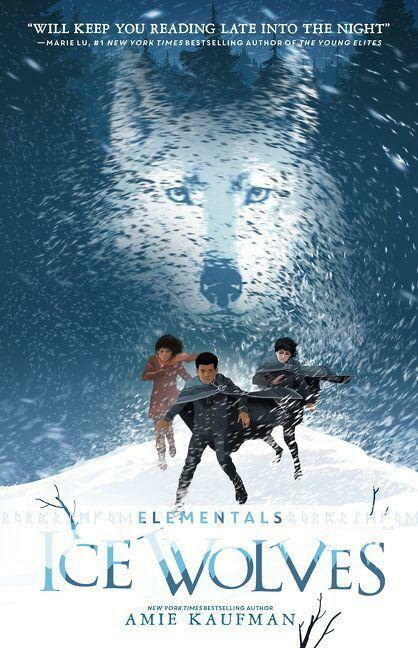 Amie Kaufman is a bestselling YA author, and Elementals: Ice Wolves is her middle-grade debut. Raised in Australia and occasionally Ireland, she has degrees in history, literature, law and conflict resolution. She lives with her husband, their rescue dog, and an extremely large personal library. She’s a huge fan of chocolate and naps, and remains partial to investigating the occasional magical door.